Mired in a homogeneous suburban hell where happiness is always one impulse purchase away, what’s a housewife to do when her frozen marriage refuses to thaw, and her children’s lives are falling apart before they’ve even had a chance to begin? A trip to a run-down, mountain home she’s inherited from a mysterious relative sounds like an ideal way to break the routine, and break the news she’s been dabbling in the dark side. Then they showed up––three masked assailants on their own little adventure filled with terror, torment and torture. Of course, there’s no accounting for the toll years of family dysfunction has taken on their victims. For Barbara, the brutal assault may be just the thing to bring her twisted family together. For the intruders, it could be wrong family, wrong time. 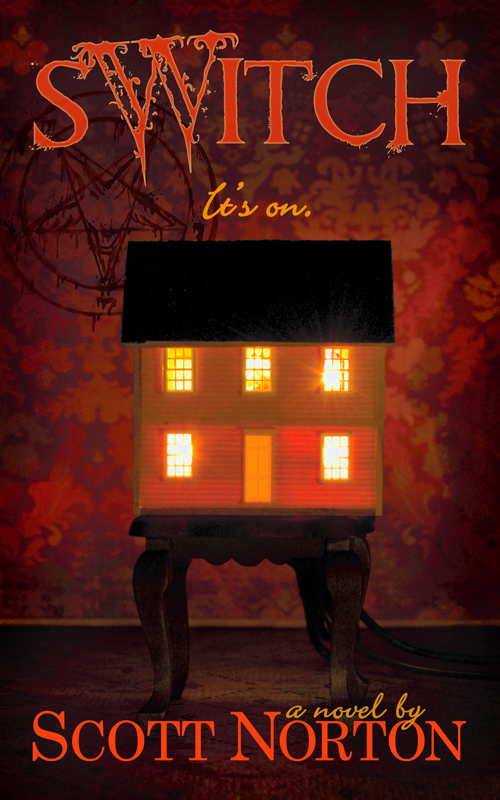 I have been lucky enough to be given a copy of sWitch by Scott Norton (thank you), the author himself (I also reviewed his novella HorrorCon not long ago), and seeing as I have been hanging to read this one I had to read it straight away didn’t I? Yes, I did. See the thing is, it’s hard for me to find a decent dark fiction that is just enough humour and just enough dark, without being too overdramatic (sometimes they try too hard to be disturbing and it’s rather disappointing), for me to enjoy so it’s really nice when I come across a book that has all those elements presented in the synopsis alone. This is why I have been looking forward to reading sWitch. I think sWitch is what I like to call delightfully gothic. It starts out as all homey and domestic, of course families have their problems so that’s not surprising, but sWitch is darker in undertone; darker in undertone, but not morbidly or depressingly so. To explain what I mean by delightfully gothic and my appreciation of it, I’d have to discuss the ending and I hate giving away spoilers so I say just read it and get back to me. The first two lines of the novel were used in my first post of Book Beginnings and in that post I mention how I enjoy those first two lines because it can be taken in any direction afterwards, all you need is imagination! And in interesting directions it did go because to me it was almost chaotic. Not chaotic in a bad sense at all, on the contrary, the story had a flow to it that you couldn’t help ride along with. It was well written in plot, environment description, and character description, so there was no chaos in that sense. The chaos is more in where the story goes, at one point you can see where it is headed, but there’s also another aspect being slowly introduced, and when you think the story has established itself it brings in that other aspect and completely disorientates you, but not in a disconcerting way. Also, rather than following a select number of people or telling the story from their point of view only, the story is told from numerous perspectives. At some point I was wondering if this would be too much and I’d end up being confused, but fortunately it worked with the characters being defined enough for you to be able to tell when the perspective switched. I think it helped too that you’re introduced to all the family members from their perspectives straight away rather than slowly. In the end all the different perspectives helped the story along instead of impeding it and one thing I love about different perspectives is when they’re utilised to not only show the good guys view, but also the bad guys. To me it shows there is no good or bad, but maybe just a little nuts or maybe psychotic… The point is you get to see it from different point of views and how one man’s idea of insane is another one’s idea of normalcy. As for descriptions, I admit I am a sucker for interesting descriptions laced with a sense of humour; therefore naturally I loved the descriptions. Add on to that the Goth side of my personality and I was pretty much done for by the time the introduction to Satan in the form of dyslexia and Santa showed up. I don’t know about readers who don’t usually read dark fiction, or for those who like overtly disturbing, but for me this is the type of book that a Goth loving book reader who appreciates a darker sense of humour should pick up and give a go, because it is a fun read with a dark twist and I look forward to reading it again sometime. Reminds Me Of: Not a story, but 1950’s mixed with some Satan worshippers. Also Carlton Mellick III and Joe Hill, but in the use of abstract ideas only.